Easyjet and Ryanair are two of Europe’s biggest and most well-known budget airlines. Together they carry more than 200 million passengers per year around the continent. In this Easyjet vs Ryanair article we will compare the airlines head-to-head in terms of some operational statistics of interest. Most figures are taken directly from each airline’s 2018 annual report unless otherwise stated. Easyjet (U2) was established in 1995 by founder Sir Stelios Haji-Ioannou. It is headquartered at London Luton Airport in the UK. Easyjet plc is listed on the London Stock Exchange (LSE: EZJ) and is part of the FTSE 100 index. Easyjet made its inaugural flight from London Luton to Glasgow on 10 November 1995 using a Boeing 737 aircraft. Its first international route was London Luton to Amsterdam which started in 1996. Ryanair (FR) was established in 1985 by the Ryan family. It is headquartered at Dublin Airport in Ireland. Ryanair Ltd is listed on the Irish Stock Exchange (ISEQ: RYA) plus additional listings in London (LSE: RYA) and in the US (NASDAQ:RYAAY). Ryanair’s inaugural flight was Waterford to London Gatwick on 8 July 1985 using a 15-seater Embraer EMB 110 Bandeirante turboprop aircraft. 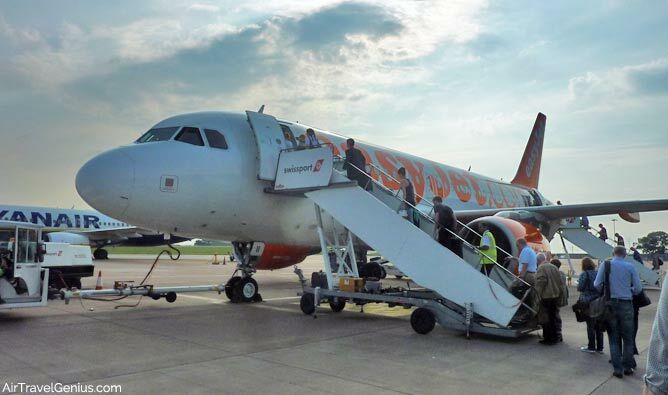 Easyjet has 28 bases, serving 156 airports and 979 routes. Its main base is at London Gatwick (LGW). Ryanair has 84 bases, serving 234 airports and 2,100 routes. Its main base is at London Stansted (STN). 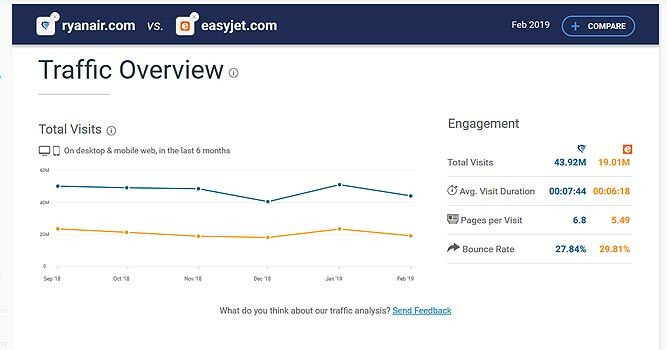 The Easyjet.com website had an average of 21 million monthly visits for the period Sep 2018 to Feb 2019. It is ranked number 10 in terms of traffic in the airline industry. Easyjet reported making 559,857 flight sectors in 12 months – an average of 1,534 flights per day. The average sector length was 1,101km. 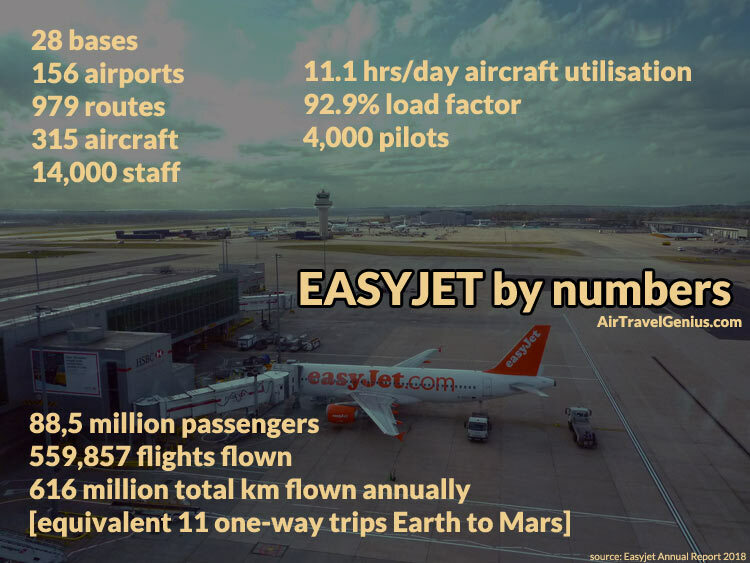 This means the total distance flown annually by Easyjet aircraft is 616 million km, the equivalent of around 11 one-way trips between Earth and Mars. Ryanair reported making 725,044 flight sectors in 12 months – an average of 1,986 flights per day. The average sector length was 1,247km. 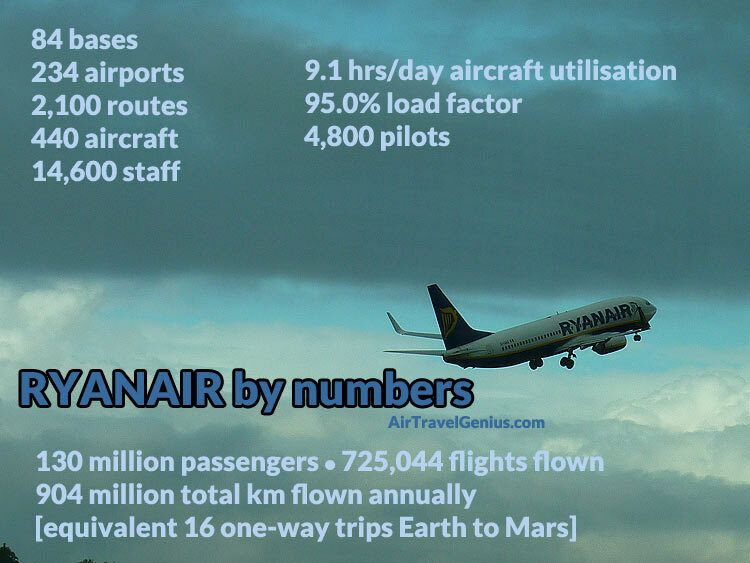 Likewise, the total distance flown annually by Ryanair aircraft is 904 million km, the equivalent of around 16 one-way trips between Earth and Mars or roughly a one-way trip from Earth to Jupiter! Easyjet currently flies 88.5 million passengers per year with an average load factor of 92.9%. That’s 242,000 passengers per day on average, although there will be more passengers flying during the peak summer season. Ryanair currently flies 130.3 million passengers per year with an average load factor of 95.0%. That’s 357,000 passengers per day on average. Easyjet reported a fleet of 315 aircraft comprising of 132 Airbus A319, 168 Airbus A320, 13 Airbus A320neo and 2 Airbus A321neo. It utilises its aircraft 11.1 hours per day. Ryanair reported a fleet of 440 Boeing 737 aircraft. It plans to have a fleet of 585 aircraft by 2024. It utilises its aircraft 9.1 hours per day. The average Easyjet fare is €60. The average Ryanair fare is €39. Easyjet planes have grey-orange seats in a 3-3 configuration. The seat pitch is 29″ and the seat width is 18″. Easyjet seats do not recline but do have a seat pocket. The Airbus A319 has 156 seats; the Airbus A320 has either 180 or 186 seats. All seats are economy class. Easyjet sells allocated seating which costs between £3.99 and £23.99 per flight depending on the route and whether the seat is classed as extra legroom (first row or overwing exit), up front (rows 2-6) or elsewhere. Ryanair planes have blue-yellow seats in a 3-3 configuration. The seat pitch is 30″ and the seat width is 17″. Ryanair seats do not recline and have no seat pocket. The Boeing 737-800 aircraft has 189 seats. All seats are economy class. Ryanair also sells allocated seating which costs from €4 (standard seat), from €13 (front seats row 2-5) and from €14 (extra legroom seats) per flight depending on the route. Easyjet allows all passengers to bring 1 carry on bag (no weight limit) with maximum dimensions of 56 x 45 x 25cm including handles and wheels. An additional under seat bag (max dimensions 45 x 36 x 20cm) is only available for easyJet Plus cardholders, FLEXI fare, Up Front or Extra Legroom customers. Ryanair allows all passengers to bring 1 small bag measuring up to 40x20x25cm which must be placed under the seat in front. Only those purchasing “Priority & 2 Cabin Bags”, Flexi Plus, Plus or Family Plus fares can take a second bag of up to 10kg and 55 x 40 x 20cm. This can be stowed in the overhead lockers. Easyjet has 14,000 staff members which includes nearly 4,000 pilots and over 8,500 cabin crew. The Easyjet CEO is Johan Lundgren. Ryanair has 14,583 staff members which includes 4,831 pilots and 8,263 cabin crew. The CEO is Michael O’Leary. In 2018 Easyjet reported an operating income of £578 million on £5.898 billion of revenue. Easyjet made £13.68 per passenger in (non-seat) ancillary revenues. In 2018 Ryanair reported an operating income of €1.667 billion on €7.151 billion of revenue. Ryanair made €15.48 per passenger in (non-seat) ancillary revenues. Easyjet’s longest route is London Gatwick (LGW) – Hurghada (HRG) in Egypt which is 2,425 miles and has a scheduled flying time of 4 hours 45 minutes. Ryanair longest route is Stockholm Skavsta (NYO) – Tenerife South (TFS) which is 2,655 miles and has a scheduled flying time of 5 hours 50 minutes. Easyjet’s shortest route is Belfast (BFS) – Isle of Man (IOM) which is just 76 miles. The scheduled flying time is 45 minutes. Ryanair’s shortest flight route is Valencia (VCN) – Ibiza (IBZ) which is 108 miles. The scheduled flying time is 50 minutes. Both airlines have significant route coverage throughout Europe and also serve a few destinations in North Africa and Israel. Easyjet and Ryanair rarely compete on the same route. The figures show that Ryanair is statistically the bigger airline of the two. Ryanair has improved its customer service over the last few years via its Always Getting Better program and does offer slightly lower fares than Easyjet and its competitors. However Ryanair has had some issues with flight schedule cancellations. Whilst both airlines should continue to expand in the coming years there are uncertainties about the airline landscape following the UK’s Brexit decision to leave the European Union. DISCLAIMER: Information can change; we try to provide accurate information though we are not liable for any inaccuracies. Which Airlines Accept Paypal Payments for Flights?